Bandung is the capital city of West Java, and the third largest city in Indonesia after Jakarta and Surabaya. Nicknamed Parijs van Java (Paris of Java) by the Dutch for its resemblance to Paris and European atmosphere back in colonial times, Bandung also earned another nickname as Kota Kembang, literally meaning the Flower City since Bandung used to have a lot of flowers. Being located at the altitude of 768m and surrounded by the lush and beautiful Parahyangan mountains makes the climate mild and pleasant. The city has been well known for its universities, fashionable clothing and as a great place for gastronomic adventure. Nowadays, Bandung has become a very popular weekend escape for Jakartans, who would crowd the city on weekends and national holidays. Map of Bandung. Click for larger version. In this page, Bandung is divided into unofficial districts that are used mainly for travelling purposes only. The districts below are listed from top to bottom, from left to right. Mainly industrial and developing residential area. Hussein Sastranegara International Airport is here and also the Aircraft industry. This region is connected to the west with Cimahi and Padalarang where you can find more industries, and also the Kota Baru Parahyangan (residential area). Two long strips that contains upscale residential area (on Jalan Cipaganti) and Bandung's jeans center (on Jalan Cihampelas). Stride on small streets between those two main street and you will find more relaxed residential area with some nice cafes dotting the area. Cihampelas Walk Mall (open concept) is in this area. Travel service from Jakarta mostly have terminal in this area. In the colonial era, this is the favorite residential area for rich people. Currently you can find row of factory outlets, restaurants, and hotel along Jalan Dago (Jalan Ir. H. Juanda). Together with Riau/Gedung Sate Area, this part of the city is undergoing a tremendous change in the process of gentrification. You can find the Bandung Institute of Technology and Bandung Zoo here. The area is nice to explore, possible on foot but preferable by car. Another upscale residential area in the hilly part of the city. It boasts many restaurants that overlooking Bandung basin and you can see the city light in the evening. Some nice cafes and art gallery have found a way in here. Contains middle class residential area in the vast area further to the east of Bandung. Contains the Saung Angklung Mang Udjo. Part of the historical colonial government complex which is very planned and nice to explore on foot. Together with Dago area, this part of the city is undergoing tremendous change in the process of gentrification. You can find many restaurants and factory outlets in this area. A lot of trees shading the road making this area a perfect location for cafes. Be sure to stop by Gedung Sate as the architectural heritage in Bandung. This is the new important business area in Bandung. Contains Bandung's railway station, Paskal Hypersquare, and Istana Plaza Mall. Also part of the historical colonial government complex similar like Riau/Gedung Sate Area. But this area has more building that still functional as government / military building. Broad road and big government complexes mark the area. Contains Bandung's city hall, the central bank office, Bandung's cathedral, and many more historical building. Together with Riau and Dago Area, a lot of architectural sights here. The famous Braga street is here. This is a very busy business and China town area. Contains Pasar Baru Trade Center with its grand bazaar style. On weekdays continually suffering from traffic jam. A vast area that is dense with residential, business, and industrial area. Majority are not a tourist area except some dots like the shoes production center in Cibaduyut. Contains a lot of textile and garment industry that is the main industry in Bandung area. Although the oldest written reference to the city dates back to 1488, there were numerous archaeological finds of Australopithecus (Java Man) that lived on the banks of Cikapundung river and the shores of Bandung's Great Lake. In the 17th-18th century, the Dutch East Indies Company (VOC) created small plantations in Bandung, with a road to Batavia (today's Jakarta) completed in 1786. In 1809, Louis Bonaparte, the ruler of the Netherlands and its colonies, ordered the Dutch Indies Governor H.W. Daendels to improve Java's defences against the threat of the British, who occupied the nearby Malay peninsula. Daendels responded by building the Great Post Road (De Groote Postweg) that stretched about 1000km between the west and the east coasts of Java. Because the north coast had impassable swamps and marshes at the time, the road was diverted through Bandung along what is now Jalan Asia-Afrika. Daendels liked Bandung's strategic location so much that he ordered the capital to be moved there. Military barracks were built and Bupati Wiranatakusumah II, the chief administrator of that area, built his dalem (palace), Masjid Agung (the grand mosque) and pendopo (meeting place) in the classical Javan alun-alun (city square) near a pair of holy city wells (Sumur Bandung) and facing the mystical mountain of Tangkuban Perahu. Powered by its cinchona (for malaria drug quinine), tea, and coffee plantations, Bandung prospered and developed into an exclusive European style resort with hotels, cafes, and shops. Many of Bandung landmarks, including the Preanger and Savoy Homann hotels, as well as the shopping street of Jalan Braga, are still available today. The Concordia Society building, now Gedung Merdeka, was built with a large ball room as a club for rich Europeans to spend their weekends. 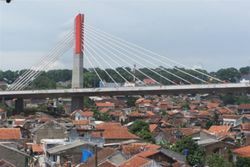 Pasopati bridge flyover, a new landmark of Bandung. In 1942, after Japanese soldiers landed in coastal areas of Java, the Dutch retreated from Jakarta to Bandung, but were driven out from there as well and surrendered soon after. After the end of the war, first the British and later the Dutch came back trying to reestablish the pre-war colonial situation, but on 24 March 1946, during the struggle for Indonesian independence, the city of Bandung was burned down by retreating forces of the TRI, because they would not comply with the order given by the British forces to move out of Bandung to the south (Bandung Sea of Fire/Bandung Lautan Api). For the TRI this act was a sign of refusal to surrender. Over 200,000 people fled the city during the incident. In 1955, the Asia Africa Conference (Konferensi Asia Afrika) was held in Bandung, paving the way for the creation of the Non-Aligned Movement in 1961. The Indonesian parliament was located in Bandung from 1955 to 1966, but was moved back to Jakarta in 1966. Today's Bandung is a sprawling city of 2.7 million people and suffers from many of the same problems as other Indonesian cities. Traffic is congested, old buildings have been torn down, and once idyllic residences have turned into business premises. Jalan Asia-Afrika, the former Grote Postweg, still remains as one of Bandung's main thoroughfares and connects together the alun-alun (city square) with many of the city's colonial landmarks. Please refer to the district map of Bandung: the most important district for tourist majority are located in north of Bandung. The easiest landmark for your orientation is the north/south border by the railway and or the new Pasupati elevated road. Once you identify whether you are located north or south of Bandung, identify the area immediately, the landmark will be the major road in the intended district/area and the major building / tourist attraction on that road. Discuss using compass direction (north/east/west/south) of that major building / major road. Since Bandung is not organized in blocks, this is the way local organize themselves and is a very effective way to discuss way to go with local. Road in bahasa Indonesia is translated into Jalan and abbreviated into Jl. ; this applies to all kind of road from small road to major road. You will see a lot of Jl. in front of the road name in this guide. Very small road that cannot by passed by car is called Gang and abbreviated into Gg. Bandung has a tropical monsoon climate, which borders subtropical highland climate. The city is noticably cooler than other cities Indonesia, due to altitude influence. Still due to its position in the equator, the city experiences very small temperature variations throughout the year, while temperatures have never risen above 35°C (95°F) or fallen below 11°C (51°F) The average year-round rainfall measures 1,838mm (72.3 inches) and the majority of it falls between October and June. 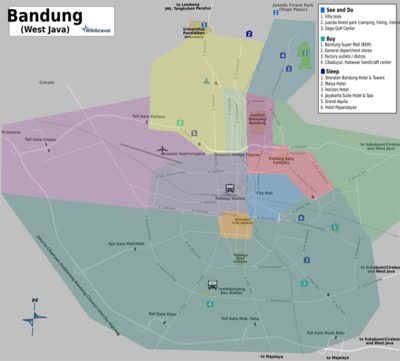 Map of Bandung in detail. Bandung is located in the central highlands. It can be reached from Jakarta either via the toll road or railway by train. When using the road, there are many small buses connecting Jakarta and Bandung. An alternative to the toll road is the winding and mountainous roads through Puncak (=Peak). The route through Puncak is quite scenic but on weekends and public holidays the traffic is congested. Bandung's Husein Sastranegara (IATA: BDO) airport has a difficult location among the mountains and has only limited services with narrow-body airplanes. The airport is located at the end of Pajajaran Street, 4km from the centre of the city. There's no metered taxi available from bandung airport. The official taxi of the airport didn't use meter and will only served once you had a taxi ticket (the ticket shown the amount you have to pay to the driver) which can be bought at the taxi booth near the international arrival exit gate, they charges minimum of IDR40,000 (about USD5). Most hotels provide a free airport transfer services. Garuda Indonesia  - operate daily flight from Surabaya,Denpasar (Bali), Batam. Lion Air  - operates twice daily from Denpasar, and Surabaya, daily from Banjarmasin, Batam and Medan. Silk Air  - operates 5x weekly flight from Singapore. Jakarta's Soekarno-Hatta airport is about 3 hours away (plus any traffic jams). A number of companies offer direct shuttle services; see the next section for details. Travellers arriving direct into Bandung airport will find that it is very close to the city. Taxi fares are fixed at IDR42,000 to most parts of the city. Buy the ticket at the counter because when you ask the "mafia" controlled taxis nearby, they will quote you IDR70,000. The fixed price is still a rip off as the taxi fare from our airport at Bandung SuperMal to the airport, in the morning only cost us IDR30,000. It's a monopoly contracted out to only one taxi company. If you're early at the airport, check-in and walk out of the airport to a small cafe across that road that serves hot noodles, kway teow and tea for half the price you'll pay for it inside the airport (again another monopoly). Bus services connect Bandung and smaller surrounding cities. Several long-route buses are also available from major big cities. The most convenient way is the air-conditioned bus with the express or non-stop tag. The main bus terminals in Bandung are Leuwipanjang, serving buses from the west (Bogor, Jakarta, Merak, Pandeglang, Tangerang, Depok, Bekasi, Cikarang, Cibinong and Sukabumi, and also buses to as far as Medan) and Cicaheum, serving buses from the east (Cirebon, Garut, Tasikmalaya, Banjar, Pangandaran, Indramayu, central Java cities, eastern Java cities and also from Bali Island). Long-haul bus tickets usually includes a snack and a Javanese buffet meal in a restaurant in the middle of the journey. With 6-12 seater minivans leaving every fifteen minutes up to every 1 to 2 hours depends on the providers, the shuttle bus market between Jakarta and Bandung is fiercely competitive. Roughly speaking, services can be categorised as either door to door in a chartered car or van that takes your group exactly where you want to go, for around US$50-75, or point to point from a terminal to another, for under US$10. Many companies offer both. Most shuttle providers use Isuzu Elf minivan (similar with Toyota Hiace, but bigger & more spacious) and some companies offer more luxurious options using Toyota Alphard or Hyundai H-1 with a higher fare and distinct routes, but some routes are deleting, because the high price fare after high increase of diesel fuel made consumers use lower grade of shuttle bus. 4848 Taxi. Jl Prapatan 34, Jakarta. ☎ +62 21 381 4488, +62 21 386 4848. The service is great, reliable and safe. Price: approx. US$ 25/car (4 persons). One destination only in a small area in Jakarta, so you have to ask which area in Jakarta the will serve. DayTrans,  (Indonesian-language only) Jakarta (Blora, Sarinah, Fatmawati, Karet, Mall Senayan City, FX Plaza, Meruya-Intercon, Kebon Jeruk-Binus, Grogol, Atrium Plaza, Hotel Acacia, Cempaka Putih Pulomas, Tebet/Pancoran and Jatiwaringin), ☎ +62 21 7063 6868 atau 6386 4005. Bandung (Dipati Ukur, Cihampelas and Pasteur), ☎ +62 22 7063 6868. Rp 90,000 for a share ride. Cipaganti, Probably the biggest name in the business, they serve over a half a dozen points throughout Jakarta and its suburbs from their various terminals in Bandung, such as Bandung Trade Center (BTC) on the western side of the city (Pasteur), Cihampelas, and many more, with shuttles leaving every 30 min or so on most routes. Rp 100,000 for a shared ride (Note: special discount rates apply for students), Rp 700,000 for a point-to-point charter. Star Shuttle, This is belong to Cipaganti Group to compete with Baraya. ☎ +62 21 700 500 000 and +62 21 700 500 000. Same as with Cipaganti, you have to mention that you will use Star Shuttle. Baraya, The ticket fee is only Rp 70,000 for a shared ride. ☎ +62 21 7244 999 and +62 22 253 3456. Primajasa Bus, ☎ +62 22 607 3992 (Bandung), ☎ +62 21 800 9545 (Jakarta). Direct shuttle service from Jakarta's Soekarno-Hatta airport to Batununggal but they don't stop at Bandung Super Mall anymore. The trip takes c. 3h and the cost is c. USD8.50/person or IDR75,000. Schedule: once every half hour from 00:30-16:00. Their buses feature a smoking room and toilet at the back. From Lebak Bulus bus terminal in Lebak Bulus, South Jakarta, the Primajasa costs IDR50,000. There will be a numerous other buses running the route from Lebak Bulus, and Kampung Rambutan bus terminal - it is possible to get an economy bus for IDR20,000, although it will be full of people smoking, non air-conditioned, and probably less secure. Ask around, but always be cautious in bus terminals in Indonesia - especially at night. Silver Bird Van Taxi (Blue Bird Group), Jl. Mampang Prapatan Raya 60, South Jakarta. ☎ +62 21 798 1234. Price: Rp 750,000 door to door, plus toll fee Rp 40,000. X-Trans, Jl. Blora 1 AB, Central Jakarta, ☎ +62 21 315 0555. Price: approx. US$55/car maximum 10 persons for point-to-point charter or Rp 90,000 for a share ride. CitiTrans, Jakarta (Fatmawati, Bintaro, Sudirman, Kelapa Gading, Pasar Pagi, Central Park), ☎ 08041111000. Bandung (Dipati Ukur, Cihampelas Walk, Pasteur), ☎ 08041111000. Rp 90,000 single-trip, non-stop, on 7 or 10-person (depends on pool) shuttles with separate seats. Due to competitions, all shuttles now only have 2 prices, for 6-10 seats about Rp90,000-Rp100,000 and for 10-12 seats about Rp60,000-Rp70,000 in a minibus. While Taxis use car with maximum 4 passengers, excluding the driver. Bandung is two hours away from Jakarta by car, thanks to the new Cipularang toll road that completes the inter-city highway between Jakarta and Bandung. It is now faster to travel to Bandung by car than by train from Jakarta. During the rainy season, parts of the Cipularang toll road may be closed because of landslides. 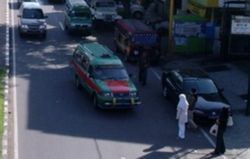 On weekends, traffic jams often occur near the toll gates in the Djunjunan/Terusan Pasteur area. One alternative route is by the slower, but enjoyable, route from Jakarta - Puncak - Cianjur - Bandung. If you travel by car using this route, then make sure to stop at the Puncak Pass, the tip of the highland just on the outskirts of Jakarta. From here, the view of tea plantation with fresh air can be enjoyed. There are plenty of good restaurants and hotels out there. There is also a beautiful safari park/zoo in Puncak: Taman Safari Indonesia, Jl. Raya Puncak No.601, Cisarua, Bogor. ☎ +62 251 250 000, Fax +62 251 250555. .
State operator PT Kereta Api Indonesia  offers frequent services between Jakarta and Bandung, as well as connections onward to Surabaya. Even the fastest services take more than three hours, making this a slower option than the shuttle buses, but the scenery between Jakarta and Bandung is beautiful. The railroad passes mountains and padi terraces. Don't miss this view when traveling by train. Most hotels in Bandung provide free transportation from the train station (Bandung Hall station for upscale long-haul and medium-haul trains or Kiaracondong station for economy trains) to the hotel. Unlike most other countries, Indonesia do not use numbers for their train services, every single train will have a name. As a rule of thumb, the highest standard will be given by 'Argo' class train. The ticket can be bought online or you can get only the booking code and pay at the stations, post offices, train ticket agents, Indomaret and Alfamart stores and Railcard & Railbox. You can also directly buy tickets without booking code at these online ticket distributors. Exe = executive class, Bus = business class, Eco = economy class. All Indonesian trains are now air-conditioned no matter what the class is. The only difference between classes will be the comfort you'll experience, with executive class seats have more legroom and width, and the business will have less. Economy class has upright seats but still comfortable enough. Power outlets are available in all trains. Food is available on board and in the stations, you may also want to bring your own food. There is no uniform color, but each route has the same 2-color scheme, even the same model of minibus (some routes may mix Kijangs and minibuses). There may be custom variations to the vehicles because they are privately-owned. Usually an angkot is a modified ordinary minibus. The 10 seat minibus becomes 18 seats. This is possible by lining passengers side by side. It might be a bit awkward for the first-time users. Don't be nervous about touching other passengers,; the cramped seating often makes it unavoidable. Do be aware that some pickpockets operate on angkots. Be very careful if you see someone acting sick or odd. To stop the Angkut, just raise your hand, and when you need to get off, just shout 'kiri !!' (pron: kee-ree), translated left in English. It is a request for the driver to pull aside to the left. The most comfortable and safest seat is usually the front-window, next to the driver. The door is typically removed, so don't be scared if it is missing. For tall persons, you'll need to bend over to get in and the bench seats are really small in size. Request an angkot to stop. Travelling around in Bandung is quite complex and frustrating, especially to newcomers. There is no mass rapid transit system, metro nor tram in Bandung. Locals travel using small public minibuses, known as angkot from angkutan=transport and kota=city. This city transport has only origin and destination names on top. Sometimes with via description if there are more than one angkot route for a certain origin-destination route. There is no route description anywhere. For locals, it is somewhat amazing that they only memorize where and how the route of each angkot route. Although there is an official price for angkot from organda (the local organization of these private city transport), sometimes price is based on how far you travel. It's better that you ask the driver or kernet (driver assistance) about the price to go to a location. To ask for an angkot to stop and pick you up, just raise your hand and they will stop. When you're inside and want to stop, just ask the kernet to stop. Or say 'kiri' (key-ree) or simply 'stop' out loud. It was easy to find a bell that you can press to stop but not anymore. Most angkot fare are ranging from Rp 2000-5000, it depends on the route and distance. The official angkot routes are listed on Bandung's Info Kota website . A local startup KIRI  computes which angkot to take when getting around the city. If you don't know which angkot routes to take, then you can take a taxi. Officially, taxis use meters, but some taxi drivers may refuse to use meters and will charge you a fixed price instead. Don't be afraid to refuse and walk away, even locals are annoyed by this behaviour. Metered cabbies may also take you the long way to get more money. So be careful when traveling by taxi. The most reliable taxi company in Bandung is Blue Bird. Bluebird drivers will almost always use the most appropriate route and will always use the meter. Competing directly in the premium range with Blue Bird, Cipaganti Taxi has started their operation with a red colored car. Gemah Ripah is a third ranking taxi service that seems to be improving their service. In Bandung, taxis are less common waiting on roadsides, due to the multitude of small roads and lack of space to wait. For this reason, ordering a taxi by phone is usually the simplest and safest bet. The taxi will drive up directly in front of you (ask for its number on the phone for identification), and there is no extra charge (sans a cheap cancellation fee, if necessary). Alternatively, ask a uniformed security guard or policeman nearby to either flag down a nearby taxi, or point in the direction of a nearby taxi waiting area. Taxi drivers off the street, or booked by telephone are usually polite and friendly, chosing to charge you by meter but watch out for those mentioned below. Do allow lots of travel time in Bandung, although the city is small. A short trip that is about 8km will take you 45 min to an hour through the heavy traffic during peak times (morning 8-9am, evening 5-6pm). A short trip from Dago factory outlet areas to The Valley just a few km up north took almost 50minwhen travelling at 6pm. 4848, Jl. Suniaraja Tmr 39. ☎ +62 22 4234848. Reliable, good service on Bandung to Jakarta route. Bandung Raya, Jl. Dr Setiabudi 177. ☎ +62 22 201 4018. Blue Bird, Jl. Terusan Buah Batu 194. ☎ +62 22 7561234. Good reputation and reliable, this is the premium taxi company in Indonesia. Call center employees can speak English. Centris Taxi, Jl. Soekarno-Hatta 606-A. ☎ +62 22 7512100. Branch of Centris Taxi company in Jakarta. Gemah Ripah,. ☎ +62 22 4217070. Second choice after Blue Bird. Kota Kembang, Jl. Kiaracondong 338. ☎ +62 22 7312312. Most are trustworthy but watch out for those who wait near shopping centers and infront of hotels (except approved by the hotel), they will charge you a flat fee, refusing to take you for less. One example is taxis waiting outside "Chi Plaza" where they only take fixed fare passenger. There are also some bus lines, but they don't cover the whole city. City buses usually cover long routes across the city from end-to-end; for example, from the north to the south and from the west to the east. The city bus is called DAMRI. Using your own car or renting a car is probably the easiest and the most convenient way to travel around Bandung and surrounds. If you don't have a valid driving licence, then you can also rent a car with a chauffeur, which is very common for western travelers. Perhaps it is even better to rent a car from Jakarta. You can stop for one night in Puncak, Bogor or Sukabumi. Rental cars are available from numerous outlets, including major international brands. Note that traffic in Bandung is quite complex and the city administration likes to experiment with the traffic management. There is often a lack of traffic signs and directions. Many major roads are one-way, which makes it difficult to turn around if you are lost. Be careful not to enter a street that may a one-way street from the opposite direction but be lacking a prominent no-entry sign. There may be a watchful policeman hiding somewhere, he will pop up instantly to stop you and then you may have to pay him some money. Renting a car is about Rp500,000 per day (12 hr), or Rp600,000 (12 hr) excluded gasoline, parking and toll for travel outside Bandung e.g. to Tangkuban Perahu volcanic area. Dirgantara Car Rental, Jl. Lamping No 7. ☎ +62 022 203 5050. Bandung was nicknamed Parijs van Java for its beautiful buildings and scenery. Many historical buildings and museum located in Bandung. There were many buildings built in a classic Dutch colonial style during the late 18th and early 19th century. The locals referred to this time as the Bandoeng tempo doeloe (old Bandung) era. The art-deco style was very popular throughout the earlier half of the 20th century and the city and it's suburbs retain many fine examples of these architectural styles. The city administration has a tendency to lean toward a modern style throughout the city with many of the more recent bridges, banks, malls and commercial areas. However many of the historical buildings have conservation orders and there are some very well preserved and maintained examples of the colonial era architecture to be seen. The non-profit organization Bandung Heritage Society  has been formed recently to assist in endeavours to further preserve the city's historic buildings. Born in Ambarawa (Central Java) in 1882, Schoemaker has been renowned as the father of Bandung Art-Deco architectural style. He is famous for adapting modern European architecture to the tropical surroundings. This blending of ancient decorative elements and modern architectural features has made him the best Indonesian architect of his time. He later became a professor at the Institute Technology Bandung. Among his students was ir. Soekarno, the first president of the Republic of Indonesia. He died in 1949 in the city that he loved and buried at the Pandu cemetery, Bandung. When visiting Bandung, don't forget to visit his residence at Jl. Sawunggaling 2, where its heroic renovation has been awarded by UNESCO. His artworks include: Gedung Merdeka, Villa Isola, facade of the Grand Preanger Hotel, Cipaganti mosque, Cathedral at Jl. Merdeka, Church at Jl. Wastukencana, the Majestic theater, Gedung PLN, Landmark building at Jl. Braga, etc. Make sure you see these buildings before they're gone. Villa Isola, Jl. Dr. Setiabudi 229. Architect: C.P.W. Schoemaker. Built in 1932 for an Italian millionaire D.W. Berretty as a villa. It lies in the northern part of Bandung, overlooking the city to south and the Tangkuban Perahu mountain to the north. Villa Isola and its 2 gardens have a magnificent design by its architect, combining the unique landscape and the Indo-European architectural style. This monumental art was later used for a hotel, named Hotel de Luxe. Now it serves as UPI's (Indonesia University of Education) headmastership building. Gedung Merdeka, Jl. Asia-Afrika 65 (near alun-alun or city square). Architect: Van Gallen Last and C.P.W Schoemaker. Built in 1895 for a club house for rich people, named the Concordia Society. In 1955, this building was famous as the first Asian-African conference venue. Now it is a museum for that conference. Savoy Homann Hotel, Jl. Asia-Afrika 112, ☎ +62 22 4232244. it was built in 1880, renovated in 1938 by a Dutch architect A.F. Aabers with an art-deco style as it is seen today. It still serves a hotel until now. The King and Queen of Siam, The Prince and Queen of Belgium, The Governor General of Indo-China, The Duchess of Westminster and even Charles Chaplin had stayed there three times. You can also still stay in this hotel and enjoying the old colonial time. Grand Hotel Preanger, Jl. Asia-Afrika 81. It has two sides: the old facade and the modern wing side. The old facade has an interesting story, as C.P.W. Schoemaker designed the art-deco style that is blended with local culture. It was a controversial issue at that time, but that gives a unique style. Architect: J. Gerber, built in 1921. It was used as the head of the Dutch Indies Government Companies. The roof has a decoration of a popular satay food as now it is famous for the name, though it was not meant to be like that. In fact, it is a 6 ornaments, symbolizing 6 million guldens, the cost of the building. Now, the complex is the office of West Java governor and the local provincial house of representatives. Interestingly, this building mixes different architectural styles: Spanish Moorish style for the windows, Italian renaissance for the over all building, and between Balinese pura & Thai's pagoda for the roof. The facade faces directly to the Mt. Tangkubanperahu. The building is open for public, and at the end of the journey inside, you can sip a nice hot bajigur drink while watching the city view from the top floor. Architect: C.P.W. Schoemaker, built in 1933. It was the only mosque that was built in the European residential area in the northern part of Bandung. The central facade still has the original design, but the mosque has been expanded to both of its side. ITB West and East Hall (Aula Barat & Timur ITB), Jl. Ganesha 10. ITB is Institute Technology Bandung, the oldest institute of technology in Indonesia. It was built in 1918 by the architect Maclaine Pont. The most prominent Dutch East Indian architecture is the West and East Hall of this institute, where a West Sumatran style of architecture was used. Saung Angklung Udjo, Jl. Padasuka 118, (around 7km from Bandung), . Angklung is a traditional South-East Asian musical instrument, made by bamboo. Udjo Nalagena, a famous angklung artist, created an Angklung House in the outskirt of Bandung, where angklung is made, learned and played. You can enjoy an angklung orchestra played by 12 year old or less children or even be a part of this orchestra, holding one of the angklung instruments. The place is in the middle of padi terrace and bamboo field, a perfect location to feel the relaxedness of a small village. It is one of the famous travel destinations among westerners and is highly recommended.. The easiest way is to rent a car to go there or ask your travel agent if there is a program to visit this place. Bosscha Observatory, Jl. Peneropongan Bintang, Lembang. ☎ +62 22 2786001. [email protected]. , built in 1923 by Nederlandsch-Indische Sterrekundige Vereeniging (Assoc. of Dutch-Indies Astronomers) is the only observatory in Indonesia. It lies in Lembang, a small suburb city in the northern part of Bandung. It is now part of the Dept. of Astronomy, Institute Technology Bandung. To visit there, ask the department administration first for a reservation. Reservation must be made 1 month before. Bosscha is closed on national holidays, Sunday and Monday. Day visit at 9:00, 12:00 (except Friday at 13:00) and 15:00. Public night (17:00-19:30), between April-October, with some presentations and demos. Ask there for a specific date as this public night is open at the 7th & 8th of the lunar month. Special visit can be arranged, subject to their availability. Visiting time: every day 09:00-15:00 except Friday. Price: Free. Recommended museum by locals. Sri Baduga Maharaja Museum, Jl. Badan Kemanan Rakyat (BKR) No. 185, Tegallega, Bandung - 40243 ☎ +62 22 5210976. The museum is located on southern side of Tegallega square, south from city center. The museum is the state museum of West Java province. Opened since 1980, the museum houses historical and archaeological relics of West Java history; dated from the era of Tarumanagara, Galuh, to Sunda Pajajaran kingdom, also displaying ethnography of Sundanese culture. Visiting time: Monday-Friday 08:00-15:00, Saturday-Sunday 08:00-14:00. Mandala Wangsit Siliwangi Museum, located in Jl. Lembong 28, Bandung, is a military and weaponry museum depicting the history of Indonesian struggle for independence 1945-1949 and beyond. The museum building originally was a colonial heritage building built in 1910 as Dutch East Indies' Militaire Akademie. There are many activities that you can do in the city or outside the city. As Bandung highland is surrounded by a string of mountains. Activities in the outskirts of the city are centred about the mountain resorts, adventure activities and outdoor sports. In the city, you can have culinary activities (see the Eat section) as there are so many food varieties, shopping with many clothing outlets and distros (see the Buy section) or just hanging around. Saturday night at Jalan Dago. Every Saturday night, teenagers and youngsters are hanging around at Jalan Dago. The street stretches from Holiday Inn Hotel in the south and a few blocks to the north until Simpang Dago. The street is crowded with modified cars with loud music. Don't bring your own car if you don't want to get stuck in a traffic jam. Just walk and watch these hip-hop youngsters. There are some cafes and chic restaurants in the street that you can sit in. Don't forget to buy some grilled sweet or hot-chili corn that is sold at the street stalls. The party usually lasts until midnight. Sunday morning at Gasibu Park. After having a party on Saturday night, wake up very early in the morning around 5-7AM. Go to Gasibu park at the front of the Gedung Sate complex and wear your sportswear. At the park, you can go jogging and do some stretching, and after you finish, food stalls are already waiting for you with a lot of food varieties. People's favourites are dim sum ceker (a chicken foot cooked like a dim sum) and nasi liwet (a rice cooked with coconut milk and served with chicken and other vegetables). In the walking distance, there is a famous yoghurt drink cafe with a nice and relaxing setting at Jl Cisangkuy. Lembang trip. A trip to the north of Bandung cannot be missed. Rent a car and start to go at the very early in the morning to Lembang, an uphill resort city. On the way to Lembang, you can make a sidetrip to Bosscha, the only observatorium in Indonesia. Please make sure you have made a reservation and take a note on its opening hours. You can visit in the afternoon, to see the telescope, or at night. Their webpage is in Indonesian only. Continue your journey to Lembang and stop at one of the food stall that sells fresh milk. You can drink fresh milk with many flavours. The milk is really fresh. While this stop is interesting, it it not extraordinary in that they serve only fresh milk (strawberry, mocca flavoured) and some poor quality bread sandwiches. Stop if you need a break, give it a miss if you do not. Go to the Mt. Tangkuban Perahu. Go circling around Kawah Ratu (Queen's crater) to see the volcanic activity closely. There are other craters: Kawah Upas and Kawah Domas. Beware of the tourist hawkers who sell many things at unreasonably expensive prices. From August 2012 until further notice, Directorate of Vulcanology and Mitigation announced that 1.5 kilometers radius from Kawah Ratu might be danger for everybody. From September 3, 2012 until further notice, local authority closed Mt. Tangkuban Perahu area for visitors because of afraid of undetected harmful gas. Continue the journey to Sari Ater, a hot water spring complex. On the way, there is a good Sundanese restaurant, named Sindang Reret, that you can stop by for your lunch.s Read further down for details on visiting Kawah Domas. Sari Ater  is a resort with natural hot water spring pools, some recreation parks and healthy spas. Stay overnight and have a good dinner at their restaurant. This hot spring has shallow pools some with lukewarm and some with hot spring water for you to soak. There is a restaurant serving food just adjacent to the pools. On the way back to Bandung, take a stop at a street food stall and have some grilled 'sweet corns or grilled ketan (sticky rice) while enjoying the view of the tea plantation. Ram fighting: Villages around Bandung host ram fights on alternate Sundays. It's a big event for locals who turn out in their hundreds to watch 5-minute bouts between prize fighter male sheep. Tournaments are held in purpose-built rings in outlying villages. Best to hire a motorbike/guide in Bandung who knows when and where the next tournament is on. Ram fighting is not a blood sport but animal lovers may be upset at the sight of the fights, which are organised and refereed rather like boxing matches. Alun-alun Bandung or city square. Alun-alun is the classical central core of the democratic city in Indonesia, since the 15th century. It is typically a square of grass field with 4 sides are the city major residence, pendopo (a place to meet between citizens and the government), a mosque and a prison. The grand mosque is still visible, though it has been renovated 7 times. Now, it has undergone a major renovation and expansion with two 81 m high minarets and a Taj Mahal interior design. The pendopo is also still there, behind a high wall. The prison has been transformed into a mall with one block is preserved as a museum, a cell block where Soekarno, the first president of Indonesia, spent some time in there. The major transition is that now alun-alun serves as an entertainment park, where shopping mall buildings are surrounding the square. Bandung Zoo, Jl. Kebun Binatang No. 6. ☎ +62 22 2502770. Built in 1930. Mt. Tangkuban Perahu. Is on the northern side of Bandung, the closest city is Lembang. (Angkot route: St. Hall-Lembang). You can see it from a distance at many places in Bandung but a tour to Bandung will not be complete without visiting the crater. If you are in Bandung, take a look towards the north keeping an eye out for a mountain of unusual shape. The name itself comes from the local legend of Sangkuriang ("Legenda Sangkuriang") The legend is based upon a disobedient son who kicks his boat upside-down and was then transformed into stone. Hence the name of this mountain. Tangkubanflipped and perahu boat. It is still an active volcanic mountain. The crater is reachable by car and it is fun to do hiking to the top by foot from Lembang. Elevation is 2,084 m above sea level and the path from Lembang is not too steep. At the crater, there is a tourist spot. Near the main crater is another amazing site, 'Kawah Upas', where you stand between two big craters, to the left and to the right. Entrance fee to the park is Rp 200,000 week day / 300,000 weekend for foreigners . When you reach Tangkuban Perahu, the first thing you'll see (and most popular) is the main crater (Kawah Ratu). One crater is dormant, but has a side vent that emits some smoke. The scenery below the mountain is worth a visit. But don't stop there. Many viitors miss this but it's probably the best part of Tangkuban Perahu. 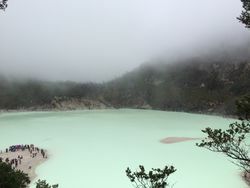 Kawah Domas. A 30 min walk from Kawah Ratu, trek 1.3 km down to Kawah Domas to get upclose and personal with volcanic activity. It is compulsory to hire a registered guide to walk you down to this active crater. They will charge Rp 300,000/hr. To visit the Kawah Domas and walk to the car park at Kawah Domas down the hill from Kawah ratu is approx 1 hr 30 min. It will be more if you indulge in mud massages, egg boiling or similar. Walk around Kawah Ratu on your own and only then get a guide if you feel you need one. Take note that the people selling tourist items will possibly hassle you. Politely tell them not to follow if you are not going to buy anything. Tourists are often pestered to retain a guide or to buy souvenirs. After finishing you do not need to walk back to Kawah ratu which makes life much easier. The walk to Kawah Domas looks like hell on earth and it is a must-do experience with bubbling mud, boiling hot water and hissing sulphur vapour. You can smell the sulfur, watch the hot water springs very closely or even buy a boiled egg cooked on the hot surface. Now there is an alterntive way to go Kawah Domas in less pain and without guide. After seeing Kawah Ratu, go down the mountain to parkir Kawah Domas (the Kawah Domas car park). Walk from here to Kawah Domas. You will still have to pay for the registered guide cpstomg Rp300,000 to enter to Kawah Domas. The walk is less tiring than the walk down from Kawah ratu, this may be better for the less fit. From Bandung Indah Plaza (BIP), take an 'angkot' heading to "CICAHEUM - LEDENG". The angkot will stop at Terminal Ledeng (Rp 3,000). From the terminal, take a mini van or 'Elep' towards Subang and get down at Tangkuban Perahu (Rp 12,000). From the entrance of Tangkuban Perahu, it's another 4-5 km hike up on a really bad road. You can often hire a local 'motorcycle cab' (local drivers are often waiting nearby) to take you up. If you can ride a motorcycle, it's a lot easier to rent one to get there. In 2012, several times Tangkuban Perahu is suddenly closed by so many vendors whom don't want to organize and everyone want to be a vendor without any regulation at Tangkuban Perahu and even they want to operate all the Tangkuban Perahu site area by themself. Juanda Forest Park or Dago Pakar (Taman Hutan Raya ir. H. Juanda). It is a forest park and serves as a water reservoir catchment area for the city. There are some interesting parks for children or to have a picnic. There are also some old WWII caves used during the Japanese occupation in the 1940s. Some people walk through the forest to reach Maribaya park in Lembang. This is at the end of Jalan Dago. The Angkot routes are Abd. Muis-Dago and followed by walking or take a ride by motorcycle. Puncrut-Lembang Hiking trail. Started from Puncrut, Jl. Kiputih, North Bandung. There are guided tours to Perahu, but charges are Rp250,000 per person (including entrance charges), so if you are 2 persons or more, it is worth hiring a car for about Rp500,000 for the day (entrance charges are extra). Shopping for clothing and accessories is the main reason many weekend visitors travel from Jakarta. Many items are less expensive than in Jakarta. Denim (jeans) stores are along Jl. Cihampelas. These became very popular in the 90s with unique facades built to attract people. The more up-market fashion stores include the many emporiums on Jl. Dago and Jl. Riau. Sisa exports (rejected export products), and factory outlets are prolific and have a very wide range of export quality items. These are sometimes available in the larger sizes that may be suitable for some visitors. A new trend are the distro (distribution outlets). Luxury labels are often available but for those the extensive upmarket malls in Jakarta may be more suitable with a much larger range, however they are often more expensive. Wayang Golek, is a Sundanese puppet show. Unlike Javanese wayang puppet, wayang golek is made from wood. Find wayang golek at Galeri Cupumanik, Jl. Haji Umar. Angklung, is a Sundanese ethnical music instrument (see at See section). Elizabeth, Jl. Otto Iskandar Dinata 520, ☎ +62 22 5201125. Leather handicrafts, including shoes, bags and other accessories. Well-known local shoe and leather craft outlets are centred in the Cibaduyut area. Jeans Street, Jl. Cihampelas. A lot of denim shops decorated with funky designs. Giant models of Superman, Goku, Rambo and others, stand guard over some of the shops. Souvenir Shop, Jl. Cihampelas no.39. ☎ +62 22 4205427. Very good quality and inexpensive local souvenirs. The shop in one of the many old Dutch colonial style buildings. Toko Sin Sin, Jl. Braga 59, ☎ +62 22 4238574. Sells various high quality handicraft and souvenirs, including wayang golek (wood puppet), wayang kulit (leather puppet), angklung, leather and crocodile skin handicraft (mostly bags, wallets, and belts), wood carvings, Indonesian traditional silverworks, paintings, and even Indonesian furniture. This is a shop with very long history, started even before Indonesia gained independence. LORI, Jl. Guntur 1, ☎ +62 22 7315604, Fax: +62 22 7311459. Ethnic contemporary styled jewellery and handicraft accessories for women and men. Product use natural, environment friendly materials such as stones, cowstone, woods, seeds and Rudrakash/Ganitrus Beads. Alun-alun. Centre of the city. In the alun-alun area there are many shopping malls, but they are rather old. Cihampelas Walk, (Ciwalk), Jl. Cihampelas. . Shopping, dining and hanging out in a cozy and relaxing atmosphere. Bandung Electronic Centre, (BEC), Jl. Purnawarman 13-15. . Specialising in electronic devices. Bandung Indah Plaza, (BIP), Jl. Merdeka 56. . Food court, cinema. Trans Studio Mall, (TSM; formerly Bandung Supermal), Jl. Gatot Subroto 289. Food court, cinema. Also offers you high class clothing stores such as Hugo Boss, Raoul, Next, Mango, Guess, Esprit, and many more. Bandung Trade Center, Jl. Terusan Pasteur 143. Food Court. Braga City Walk, Jl. Braga. . Shops, restaurants and cafes. This famous historical street still maintains old colonial style buildings. Istana Plaza, Jl. Pasirkaliki 121 - 123. . Free wireless internet, assisted taxi stand, cinema, shopping reward programs, and ice skating ring. Kings Shopping Centre, 1 & 2, Jl. Kepatihan. Food court, fashion, cinema. Setrasari Plaza, Jl. Surya Sumantri 120. Food court. Near universities. Paris Van Java Mall, Jl Sukajadi. . An attractive atmosphere with a mixed environment of outdoor and indoor mall. Carrefour, a mega international style supermarket, Gramedia, a giant bookstore, cafe, bistros. Both smaller shops and high end clothing stores such as MNG, Guess, H.O.B., and Esprit can be found here. Kepatihan Plaza, Jl. Kepatihan. Fashion, supermarket and food court. Istana Building Commodities Centre, Jl. Jendral Ahmad Yani. Building materials, electronics, computers. Bandung Electronic Mall, Jl. Naripan. Electronics, computers, cellphones and food court. Planet Dago, Jl. Ir. H. Juanda. Cellphones, bowling court. Plaza Dago, Jl. Ir. H. Juanda. Fashion, ice skate court, food court. Metro Indah Mall, (former Metro Trade Centre) Kompleks MTC Jl. Soekarno Hatta No. 590, ☎ +62 22 7538448, +62 22 7537577. Mall Lingkar Selatan, Jl. Peta. Supermarket, food court. Jatinangor Town Square, Jl. Raya Jatinangor. Shopping mall in eastern Bandung. Plaza Pajajaran, Jl. Raya Jatinangor. Cimahi Mall, Jl. Gandawijaya. The first shopping mall in Cimahi. Mall IITC Kopo, Jl. Kopo. Cellphones and food court. Bandung Trade Mall, Jl. Kiaracondong. Lucky Square, Jl. Terusan Jakarta. Plaza Cimahi, Jl. Raya Cibabat. A newer shopping mall in Cimahi. During the quality inspection, some of the products may have been been rejected, or the local manufacturers may have overrun their production quota. These residual products are sold with sisa export tags, because they were made for export. Some of these items have Grade A (best quality, but overrun product) or Grade B (export quality, but do not pass QC) qualities. Don't be surprised to see made in Korea or made in Singapore in their tags. Sometimes you will see the original price, such as US$65, but they may sell it for Rp 45,000, a fraction of the list price in the destination market. Enjoy bargain hunting but make a careful inspection yourself. Check for below-standard/damaged items. Beware also for the fake products with branded name. The shops often have a wide range of modern contemporary styles and accessories. Some stores may have a small food court. Most of factory outlets are concentrated in Jl. Riau, Jl. Dago (Jl. Ir. H. Juanda) and around Jl.Sukajadi-Jl.Setiabudi area. Distros are a new phenomenon in Bandung where a shop sells stylish products that were made by local designers. They are served as a distribution store, because these local designers do not have their own marketing label yet. The products that are sold are books, indie label records, magazines and also fashion products and accessories. After their products receive large attention they may then release their own clothing label. There are more than 200 local brand names in Bandung. One thing that makes distros stand out from factory outlet is that distros come from individual designers and young entrepeneurs, while factory outlet products come from a garment factory. Note that now distros are getting famous in Indonesia. The local branded name with free and independent motivation has been shifted. Be careful when buying in distros as the prices are increasing to a level almost the same as at boutique shops. Black ID, Jl. Lombok and Paris Van Java Mall. Bandung is a heaven for food lovers who enjoy new experiences. There are a lot of varieties, not only local cuisine but international ones. You can find any food you want for any kind of taste. Do note, that most eateries in Bandung focus on creating new variations, not making sure it tastes good. Everybody has their own favourites. One page is not enough to list all food stalls, food courts, restaurants and cafes in Bandung. Here are some lists that are popular or have a long history. Bakso Tahu / Siomay is a steamed meat with or without tofu. It is served with peanut paste, sweet soy sauce and a lime. It is suitable for a snack to eat at anytime. In almost all streets you can find somebody selling this food with a wheeled stall (gerobak). The popular place is called Siomay Pak Lili at Jl. Geger Kalong Girang that has sold this food for 15 years. 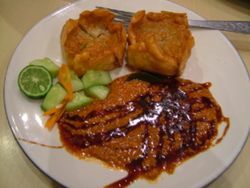 Batagor is similar to bakso tahu/siomay but it is fried instead of being steamed. It is served similar with peanut paste and sweet soy sauce. Served also as a snack. Legends are Kingsley at Jl. Veteran, selling this food already for 28 years, Batagor Riri  at Jl. Burangrang 41 (in front of the BCA building), Batagor Haji Isan at Jl. Bojongloa, Batagor Haji Darto at Pasar Simpang Dago, and Dailycious Batagor at the Summit Factory Outlet JL. RE. Martadinata (Riau) 61. Basreng is a spicy snack made ​​from fried meatballs, with the addition of the spicy and savory seasonings suitable for you. You can also buy it from online on Ruang Jualan. Martabak is a fried stuffed pancake. There are two types: sweet and savory. Sweet martabak is a thick pancake stuffed with chocolate/cheese/banana/sugar. The savory martabak is a thin fried pancake stuffed with eggs, some vegetables, mushrooms, chicken/beef and one filled with sweet corn and cheese. The most popular ones are Martabak Lodaya and Martabak San Fransisco at Jl. Lodaya. Another recommended place is Martabak Andir at Jl. Jendral Sudirman, near the Andir wet market. One more best martabak which should not be forgotten is Martabak Canada at Jl. Kebon Kawung near the Pertamina outlet. Soto Bandung is a soup with beef meat, soy beans and some vegetables. The old food stalls selling this food is at Soto Ojolali, Jl. Cibadak (near alun-alun), since 1940s. Lotek is a mixed boiled vegetables, served with peanut paste and some chillies, similar to gado gado. The hotter the better. The famous place is Lotek Kalipah Apo, Jl. Kalipah Apo, every day 9AM-16PM. Have been selling this food for already 48 years. One plate is around Rp 4,500. Mie Kocok is a noodle soup, served with beef foot, beef skin and tauge or mung bean sprout. If you don't fancy with these parts of beef, then you can ask not to have it and you can still taste its appetite. The famous place is a street vendor, Mie Kocok SKM, at Jl. Sunda. Mie Ayam is a noodle soup served with chicken and it comes with a variety of toppings. The famous place is at Mie Naripan in Jl. Naripan, they serve varieties of good noodles there. Another good place is at Bakmi Mangkok Mas in Jl. Setiabudhi. Nasi Timbel is the famous Sundanese dish. It is a tube-shaped rice that has a distinguish flavour, because it is cooked inside a banana leaf. It is usually served with lalapan (raw vegetables), fried tofu & tempe, fried chicken and chili paste. You can find this type of dish in most of Sundanese restaurants. The well-known timbel food stall is located nearby Istiqomah mosque. Another good place is at Nasi Timbel Dago at Jl. Dago for around Rp 20,000. Sate Kardjan, Jl. Pasirkaliki, open 24 hr daily . Lamb satay speciality, since 1925. Try sate buntel (a grilled minced lamb meat), tongseng (lamb meat in a coconut milk soup), nasi goreng kambing (fried rice with lamb) or sate cempe (satay from 10 month old lamb). Easy to find and on Google maps is located perfectly. Do not aspect a fancy place, it's very simple and vintage. Menu only Indonesian, no price (ask before order and use a calculator to show them the right amount). Bakmi Naripan, Jl. Naripan 108 (around the corner of Jl. Sunda and Jl. Naripan), Bandung, ☎ +62 22 4205516, a Indonesian Chinese noodle establishment since 1960's. Bubur Ayam Mang Oyo, Jl. Sulanjana (near Gasibu) and several branches. It's a chicken porridge. Nice for starting your day. Kedai Ma' Uneh, Jl. Terasana I No. 132 Pajajaran. It's in an alley in front of Pajajaran sport complex. Delicious Sundanese food. Baso Lela, Jl. Awiligar, everyday open until 9PM. On the a hill side with a nice view to the city. Try yamien, a dried boiled noodle, mixed with soy sauce. There are sweet yamien and salt yamien. Try also chicken noodle and the strawberry juice as a dessert. Santosa, Jl. Aceh, everyday open from 5PM-9:30PM. A hawker with open air eating. Open since the 1960s. Try the fried kway teow/noodle/rice. They use a special wok to enhance the taste. Located opposite of the municipal office, near KONI Jabar dorm. Waroeng Boentoet, Jl. Anggrek No. 48, Bandung (near Jl. RE Martadinata/Riau). It is the only restaurant in Bandung that specialized in a traditional heritage of delicious oxtail soup with the legendary taste sensation of the essence of spices. The Waroeng is decorated in a nice and simple vintage theme, with a very good service and affordable price that will provide its customers a high level of dine in satisfaction. Try some of its specialties like oxtail soup, oxtail teriyaki, oxtail barbeque, oxtail black pepper, oxtail chili penyet, fruits salad, black sticky rice milkshake, vegetable-fruit juice, and purple yam juice. This place is a must. Easy to find and good prices for excellent food. For those who want a breathtaking view, eat in a local Sundanese village or have romantic international cuisine. Don't expect the taste to be half as good as the view and experience though. Kampung Daun, Jl Sersan Bajuri Km 4.7 No 88 Villa Trinity Complex (you need to drive there with your own car ). Sundanese food. You eat at a hut in the middle of valley (no padi fields) near a small waterfall and river. At night it's really amazing to walk along candlelit pathways. Eating out really means eating out here. The atmosphere here is enchanting and magical. Lots of trees, bushes and secluded "pondok" small huts for relaxing and food, cool as it is set in a valley with the sound of running water from the waterfall beside you. Food prices are higher than in Bandung or even other high end restaurants cause you need to cover the cost of the use of the huts. Sierra Cafe & Lounge, Jl. Bukit Pakar no 33. Located on the hill of Dago Pakar in Bandung, Sierra delivers a relaxing and indulging ambience with a breathtaking view of Bandung's city lights. International cuisines include Western, Japanese and Thai). N Cafe, Jl. Sutra Duta Kencana II/11. Balinese & European cuisines, with great scenery, try the balinese fried duck. Kedai Nyonya Rumah, Jl. Naripan 92. Indonesian cuisine. Tizis Restaurant, Jl. Kidang Pananjung 3. European dishes with homemade bread and pastries. Atmosphere Cafe, Jl. Lengkong Besar No. 97, ☎ +62 22 4262815. Congo Gallery & Cafe, Jl. Rancakendal Luhur No.8, Dago Pakar, ☎ +62 22 2531065. This venue is famous with its romantic ambience and solid wood collections. The price is not as expensive as other same class restaurant. The Stone Cafe, Jl. Rancakendal Luhur No.5 (Gerbang Dago Resort), Dago Atas, ☎ +62 22 2500577. The Valley Bistro, Jl. Lembah Pakar Timur No. 28 (Dago) , ☎ +62 22 2531052. Sunda is the ethnic name of the local people living in West Java. Sundanese food has some distinctive features. It mainly consists of fried fish, pepes ikan (steamed fish in a banana leaf), raw vegetables and chili pastes. To try these type of foods there are numerous Sundanese restaurants. Some of the popular ones have several branches in Bandung. Dago Panyawangan, Jl Dago 137, ☎ +62 22 2507551. Sindang Reret, Jl. Surapati No. 53, ☎ +62 22 2501474. Another branch is outside the city in the north at Jl. Raya Cikole Km.22 Lembang, ☎ +62 22 2786500. The better one is the branch restaurant . Ponyo, Jl. Malabar 60, ☎ +62 22 7301477. There are many branches outside the city. AA Laksana, Jl. Soekarno Hatta 494, ☎ +62 22 7509303. There are 2 other branches at Jl. Jakarta 21 and Jl. Cihampelas 30. A big self-service eatery with long tables already filled with plates of food. Take what you want and ask the server to count the plates when finished. Ampera, The famous Sundanese restaurant in Bandung with cheap price and lot of branch. Jl. Sukarno Hatta (Cigereleng), Jl. Sukarno Hatta (Sanggar Hurip), Jl. Sukarno Hatta (Metro), Jl. Pajajaran, Jl. Pungkur, Jl. Dewi Sartika (Kebon Kalapa), Jl. Taman Citarum, Kepatihan Plaza and Jl. Raya Lembang. When we ate at Ampera on Angerrek, food was cold and tasteless. Saung Kabayan, Jl. Dr. Djunjunan. Raja Sunda, Jl. Dr. Djunjunan. Bumbu Desa, newer and more prestigious Sundanese traditional restaurant, branch in Bandung can be located at Jl. Laswi No. 1, ☎ +62 22 7100539, Jl. Pasirkaliki No. 160, ☎ +62 22 4234330 and Rumah Mode Jl. Dr. Setiabudhi No. 41, ☎ +62 22 91147980. The Duck King, Paris Van Java Mall, Jl. Sukajadi. Possibly the best Chinese restaurant in Bandung. Coca Suki, Jl. Ir. H. Juanda (Dago) 173, . A branch of the Coca restaurant in Thailand. Thai Palace, in Istana Plaza Mall. Jl. PasirKaliki and another branch at Upper Dago Area on Jl. Ir. H. Juanda No. 345 B ☎ +62 22 2503006 ; +62 22 2512857. Hanamasa, Istana Plaza. Jl. PasirKaliki. Jl. Merdeka 39-41. ☎ +62 22 4204426. Japanese restaurant with yakiniku, shabu-shabu, robatayaki, beef, chicken, seafood. Opening hours: 11AM-10PM. Approximately US$22/person. Hoka Hoka Bento, Jl. Merdeka 47. ☎ +62 22 424 5494. Japanese Restaurant with ekkado, chicken katsu, sukiyaki, koori kon nyaku, shrimp ball, beef yakiniku, shabu-shabu, teriyaki, udon. Hours: 10AM-10PM. Price is approximately US$4/person. Branches : Bandung Electronic Center 3rd Fl., Bandung Trade Center 3rd Fl., Istana Plaza 3rd Fl., Mall IITC Kopo GF., Borma Jl. Terusan Jakarta No. 53E, Metro Indah Mall GF., Kings Shopping Center 1, 4th Fl., Jl. Dr. Setiabudhi No. 61, Stasiun Bandung Jl. Kebon Kawung, Hero Jl. Buah Batu No. 237, Yogya Jl. Sunda No. 60 4th Fl. Momiji Japanese Cuisine, Jl. Braga 64, ☎ +62 22 4203786. Serving authenthic Japanese cuisine in Jalan Braga, the famous historical street of Bandung. Korean House, at North Bandung on Jl. Sukajadi No. 175 ☎ +62 22 203 1626. MYLK Steakhouse, Jalan Setiabudi 206. ☎ +62 22 2041191. European restaurant with local and imported Australian Steaks, burgers, pasta. Open 10AM-10PM (Weekdays), 11AM-11PM (Saturdays). US$4-12/person. Chef's Table Resto and Bar, Jalan Setiabudi 67. ☎ +62 22 2033453. European restaurant with selections of ribs, steaks, pasta, pizza with no MSG. Open untill 11PM. US$8-10/person. Vienna cafe & resto, Previously Cafe Venezia. Jl. Sukajadi 205. ☎ +62 22 2031277. Italian restaurant with pasta, pizza, fried chicken, salad, soup. 9AM-11PM. Approximately US$15/person. Sadewa Steak Near Pajajaran, 5 min from Airport, 10 min from Railway Station. Jl. Sadewa 24, Bandung. Specialize European steak and pasta in a cozy environment. Open 4:30PM-10PM. Price: approx. US$4/person. Canary. Jl. Ir. H. Juanda 28. ☎ +62 22 423 8928. International style restaurant withhamburger, steak, fried chicken, sate, soup, salad. Hours 7AM-9PM. Price: approx. US$7/person. Pizza Hut, well known international brand for pizza with multiple outlets including; Indah Plaza GF, Mollis GF, Kings Shopping Center 2 GF, Bandung Supermall, Istana Plaza GF, Carrefour Kiaracondong, Jl. Dr. Setiabudhi, Jl. Buah Batu, Jl. Kopo Bihbul and Jl. Ir. H. Juanda. McDonalds, American fast food restaurant providing formulaic burgers and fried chicken at Bandung Indah Plaza GF, Premiere Plaza GF, Kings Shopping Center 2 GF, Kepatihan Plaza 3rd Fl, Istana Plaza Parking Ground, Istana Plaza 3rd Fl, Dago Boutique Apartment, Griya Jl. Buah Batu, Jl. Dr. Setiabudhi, Jl. Jendral Gatot Subroto. Delivery ☎ 14045. The Stone Cafe, the unforgettable dining experience, Jl. Rancakendal Luhur No.5 (Gerbang Dago Resort), Dago Atas. ☎ +62 22 2500577. International style menu, Sundanese Menu, Chinese menu. Hours: 11AM-11PM on weekdays, 11AM-2AM on Sat and Sundays. Live music every Day. Erla's Mexican Cafe. Jl. Dago Pojok 3. opposite Sheraton Hotel @Ir. H. Juanda ☎ +62 250 5352. Owned by a local family, this cafe sells various western and mexican food, offer homey atmosphere and cheapest beers in town. Home for expatiate who are looking for evening chat and meet other tourist and foreigner. Price from 1USD/dish. open from 12pm till 3am. HDL Jl. Cilaki. Street food in stalls on pedestrian area of the street. Reportedly very delicious and affordable but you need to take caution if you are not accustomed with street food in developing countries. Food in Bandung does not stop at the restaurants/cafes. There are plenty of bakeries in the city that you can buy some pastries. Some of them have high popularities that you must take a queue even before the shop is open in the morning. Sumber Hidangan, Jl. Braga 20, in the colonial centre of the city. The bakery was opened as Het Snoephuis (The Candy House) in 1929. The interior is still much the same as it was in earlier times. Breads and cookies' have names in Dutch, such as zwieback, roomsoes, krentenbrood, saucijzenbrood, suiker hagelslaag. Its old-time ambience and original menu attracts tourists and long-time patrons, but the run-down premise and declining sophistication of its foods and services suggest a losing struggle to remain in business. Open daily from 8:30AM-7PM, closed on Sunday. Bawean Bakery, Jl. Bawean 4. Established in 1946, the name was Sweetheart Bakery until they changed it name during the New Order regime. The new name is taken from the shop location in Jalan Bawean. Their specialties are cakes baked using rum; such as nougat rolls, brownies and similar. By using this alcoholic ingredient their cakes taste a bit bitter but they can be kept for up to 6 days. Brussel's Spring, Jl. Sumatera next to the Exsport Station bag store. Steaks and waffle ice creams are very tasty. The prices range between Rp 20,000-75,000. Kartika Sari, try the famous cake: pisang molen, a cake stuffed with banana. Very delicious. There are 6 stores: Jl. Kebon Jukut 3C, Jl. Buah Batu 165A, Jl. H. Akbar, Jl. Kopo Sayati 111A, Jl. Terusan Jakarta 77E, Jl. Ir. H. Juanda (Dago). Brownies Kukus Amanda, Jl. Rancabolang 29, Jl. Lodaya 8, Jl. Purwakarta. Try brownies kukus, steamed brownies with melted chocolate inside. Soft and very delicious. Very popular and people sometimes queue waiting for it to open. Brownies Primarasa, Jl. Kemuning 20, Jl. Buah Batu 169A, and Jl. Peta 169. Speciality is the chocolate brownies. Dunkin Donuts, Jl. Ir. H. Juanda No. 51, ☎ +62 22 4208617. Airport Hussein Sastranegara. American bakery chain with donuts, croissant and sandwiches. Price: approx. US$3/person. Sus Merdeka, Jl. Merdeka (in front of Bandung Indah Plaza). Famous for its Choux/puff pastry with rum butter filling. J.Co Donuts & Coffee, Well known local donut shop with fascinating flavours. Paris Van Java Mall GF, Istana Plaza GF, Bandung Supermall GF, Cihampelas Walk GF. Braga Permai (formerly Maison Bogerijn), Jl Braga 58. ☎ +62 22 420 1831. Famous ice cream parlor in Bandung. Baskin and Robbins,. Jl Sukajadi 232, ☎ +62 22 203 8457. Jl. RE Martadinata No. 225,☎ +62 22 720 8122. Jl. Gatot Subroto No. 289, ☎ +62 22 910 1404. Istana Plaza, Jl. Pasir Kaliki 121-123, ☎ +62 22 6000403. . Ice cream parlor. Rasa Bakery, At the intersection of Jl. Tamblong & Jl. Asia Afrika. One of the best places for ice cream in Bandung. The traditionally made ice cream. Rp 10,000-20,000. I Scream for Ice Cream, Jl. Hariangbanga. Alcoholic drinks can often be found at bars, night clubs, hotels and 24 hr mini-markets. Drinking fresh icy yogurt or juice is very tempting, especially after spending a day in a hot sun. Yoghurt Cisangkuy, Jl. Cisangkuy (near Gedung Sate complex). It has many flavours of fresh yogurt with fresh fruits. Very suitable as a resting place after walking in the hot weather. Es Cendol Elizabeth, in front of the Elizabeth bag shop at Jl. Otto Iskandar Dinata and Jl. Cihampelas. Cendol is an Indonesian drink made with coconut and coconut milk, served with ice cubes and sweet brown sugar. Bandoengsche Melk Centrale (BMC), Jl. Aceh 30, in an old Dutch colonial house. They specialise in fresh milk beverages. Rumah Kopi, (Coffee house). Jl. Awiligar (near baso Lela). They serve many kinds of coffee. Susu Segar Lembang, at many street vendors in Lembang. It is outside the city, but it would be nice to stop if you do a sidetrip to Lembang. Es Sekoteng Bungsu, Jl. Bungsu 29. Es sekoteng is a grated ice cube with avocado, young coconut and kolang-kaling (some local preserved fruit). Dago 34, Jl. Dago no. 34. Located in the heart of Dago. Warung Internasional, Jl. Dago. it located near Dago 34. Taurus, located near Alun-Alun, it's easy to find. Aston Hotel and Residence Jl. Braga 99-101. ☎ +62 22 8446 0000, (fax:+62 22 8446 0100), . 4 star hotel inside the Braga City Walk. Grand Preanger Jl. Asia-Afrika 81. ☎ toll free 0 800 182-1112 or +62 22 423 1631 ([email protected]), (fax:+62 22 4231631), . In the Alun-Alun area, the facade has an art-deco style. 5 stars. Panghegar Jl. Merdeka 2. ☎ +62 22 423 2286 ([email protected]). (fax:+62 22 423 1583) . In the city centre with a revolving restaurant on the roof. 4 Stars. Hilton Bandung Jl. HOS Tjokroaminoto No. 41-43. ☎ +62 22 8606 6888 (fax:+62 22 8606 6999), . 5 stars. The Trans Luxury Hotel Jl. Gatot Subroto no. 289. ☎ +62 22 8734 8888 (fax:+62 22 8734 9999),. Located in the area of Trans Studio Bandung. 6 stars. Hyatt Regency Bandung, Jl. Sumatera 51. ☎ +62 22 421 1234, ([email protected] fax: +62 22 4210380) . 252 rooms and suites in the city centre with Indonesian decor, marble bath, working desk, broadband internet access, daily newspaper, in-room coffee and nightly turndown. Regency Club lounge for free continental breakfast, evening cocktails and canapes. 5 stars. Le'aries Garden Hotel & Amigos Restaurant, The hotel lobby entrance Jl. Cibogo No.11, annex Jl. Terusan Pasteur (200m from Toll Gate). ☎ +62 22 200 7408 ([email protected]), (fax:+62 22 200 7406). Amigos Bandung is the biggest Mexican restaurant in Indonesia, and one of the largest in South East Asia. It offers authentic Mexican food and decoration. The Le'aries hotel is the only hotel with full citi-garden view. 3 stars. Santika Jl. Sumatera 52-54. ☎ +62 22 420 3009 ([email protected]), (fax:+62 22 423 9601) . 3 stars. De Riau Motel Jl. Cimanuk 37. ☎ +62 82 11 78910 88, +62 611 77 110 ([email protected]) . Affordable cheap motel at the city center. In close proximity to Gedung Sate, Geology Museum as well as youngster favourite Factory Outlets. Savoy Homann Jl. Asia-Afrika 112. ☎ +62 22 423 2244 ([email protected]) (fax:+62 22 423 6187) . Bandung's oldest hotel and one-time host to Charlie Chaplin and Yasser Arafat, among many others. The current building is a striking art-deco work from the 1930s. Getting a little long in tooth. Renovated in 2007. 4 stars. Vue Palace Hotel Jl. Otto Iskandardinata no.3. ☎ +62 22 426 6288 ([email protected]). 4 stars. Holiday Inn, Jl. Ir. H. Juanda (Dago) 31-33. ☎ +62 22 421 1333 ([email protected] (fax:+62 22 4216666) . Lower Dago area. 4 Stars. Aston Primera Pasteur, Jl. Dr. Junjunan 96. ☎ +62 22 206 0123 (fax:+62 22 206 0124) . Hotel & conference centre. 4 stars. The Luxton, Jl. Ir. H. Juanda (Dago) 18. ☎ +62 22 4220 700, (fax +62 22 4220 600) . 4 stars. Sheraton Inn Jl. Ir. H. Juanda (Dago) 390. ☎ +62 22 250 0303 (fax:+62 22 250 0301) . Upper Dago area, close to the dago golf centre. 5 stars. Jayakarta Jl. Ir. H. Juanda (Dago) 381A,. ☎ +62 22 250 5888 ([email protected] (fax:+62 22 250 5388) . Upper Dago area. 4 stars. De Bukit Dago Jl. Bukit Pakar Timur IV/D6 (Dago). ☎ +62 22 93 19 8989, +62 82 11 78910 88. ([email protected]) (fax:+62 22 4207950), . A villa/guest house in the Dago hill area with Bandung city views. Patra Jasa, Patra Jasa. Jl. Ir. H. Juanda 132. ☎ +62 22 250 4664. (fax:+62 22 250 4995). Close to Bandung Institute of Technology. 2 stars. Geulis, Jl. Ir. H. Juanda no. 129. ☎ +62 22 250 7777, +62 22 250 3600. (fax:+62 22 250 3086). 3 stars. Marbella Dago Pakar, Komplek Resort Dago Pakar, Desa Ciburial Kecamatan Cimenyan. 5 stars. Garden Permata, Jl. Lemahneundeut no. 7. ☎ +62 22 201 1000. 4 stars. GH Universal, Jl. Setiabudhi 376. ☎ +62 22 2010388. 5 stars. Dago Guest House Jl. Bukit Dago Selatan 53B, Dago. (Located in the West Java Art & Culture Complex (Kompleks Taman Budaya Propinsi Jawa Barat)). ☎ +62 22 250 7050, (fax:+62 22 250 7030), ([email protected]), . Private bathroom with shower, A/C, cableTV. Book online for cheaper rates. Free airport pickup, internet. Tamara Guest House Jl. Wira Angun-Angun No.46. ☎ +62 22 420 4442, , ([email protected]). Guesthouse with single, twin, and triple bedrooms, with private bathroom, western appliances and hot water; Free continental breakfast, internet access, cableTV in common room, trilingual host; English, Dutch, Indonesia. Taxi, tour, and car rental can be arranged. De Villa Kompleks Villa Istana Bunga, Villa keluarga. North Bandung, Parongpong - Cisarua. ☎ +62 22 93 19 8989, +62 82 11 78910 88 ([email protected]), (fax:+62 22 426 0799), . Spacious garden, 24 hr private security, public swimming pool, basketball and tennis court. Bandung city view and scenery view. The Padma Bandung Jl. Ranca Bentang 56-58. ☎ +62 22 203 0333, ([email protected]) (fax:+62 22 2030633) . 5 star with view to the northern hills, swimming pool. De Bale Townhouse (Kompleks Bale Pakuan Town house) ,Jl. Cimbuleuit 197. ☎ +62 611 77 110, +62 22 93 19 8989 [email protected]). . Newly built town house with modern architecture. Novotel Bandung Jalan Cihampelas No 23. ☎ +62 22 421 1001, (fax:+62 22 4212999), (. 4 star hotel. Aston Tropicana Hotel Jalan Cihampelas no. 125-129. ☎ +62 22 203 0101. ([email protected]). 5 star. Villa Roberni Villa Istana Bunga, V3 North Bandung, Parongpong. ☎ SMS and WA only +62 896 4412 3952 ([email protected]), (fax:+62 22 278 9443), . Hotel Mitra ,Jl. WR. Supratman No.98. ☎ +62 22 720 7245. (fax:+62 22 721 8304).. 3 stars. Arion Swiss Bellhotel (formerly Citra Cikopo), Jl. Otto Iskandardinata no. 16. ☎ +62 22 424 0000. (fax:+62 22 426 6270). 4 stars. Grand Aquila Jl. Dr. Djundjunan (Terusan Pasteur) 11. ☎ +62 22 203 9280, (fax:+62 22 2039282), , ([email protected]). Nearby the Pasteur toll gate. 5 stars. Papandayan Jl. Jend. Gatot Subroto 83. ☎ +62 22 731 0799 ([email protected]), (fax:+62 22 7310988), . 4 stars. Horison Bandung Jl. Pelajar Pejuang 121. ☎ +62 22 730 5000 ([email protected]), (fax:+62 22 731 0993), . 4 star in the residential Buah Batu area. Dinas Pariwisata Kota Bandung: JL. Ahmad Yani No. 227, ☎ +62 22 7210768. .
Jl. Stasiun Timur No. 1, ☎ +62 22 421 6648. West Java Police HQ (Polda Jawa Barat) : Jl. Soekarno Hatta No. 748, ☎ +62 22 7806392. West Bandung (Polresta Bandung Barat), Jl. Sukajadi No. 141A, ☎ +62 22 203 1615. East Bandung (Polresta Bandung Timur), Jl. AH. Nasution No. 21, ☎ +62 22 7805981. Central Bandung (Polresta Bandung Tengah), Jl. Jend. Ahmad Yani No. 282, ☎ +62 22 7200058, +62 22 7271115. Cimahi (Polres Cimahi), Jl. Raya Cibabat,☎ +62 22 2031181. Poland Honorary Consulate, Jl. Bukit Pakar Utara No. 75, ☎ +62 22 2503765. RS Umum Pusat Dr Hasan Sadikin, JI. Pasteur No 38, ☎ +62 22 2034953. RS Advent Bandung, JI. Cihampelas No 161. ☎ +62 22 2034386. RS Immanuel Bandung, JI. Kopo No 161. ☎ +62 22 5001656. RS Santo Yusup Bandung: Jl Cikutra No.7. ☎ +62 22 7208172. RS Muhammadiyah Bandung: Jl. KH Ahmad Dahlan No.53. ☎ +62 22 7301062. Santosa Bandung International Hospital: Jl. Kebonjati No.38. ☎ +62 22 4248555. RS Kebonjati : Jl. Kebonjati No. 152. RS Advent : Jl. Cihampelas No. 161. RS Al Islam Bandung : Jl. Sukarno Hatta No. 644. North: mount Tangkuban Perahu. Lembang is a favourite weekend break destination at the base of the mountain with hiking trail and active volcanic crater, also known for its famous fresh milk. You can stay at Sari Ater , a natural hot spring water complex, or rent a villa. In the vicinity, Maribaya park offers a wonderful waterfall traps. 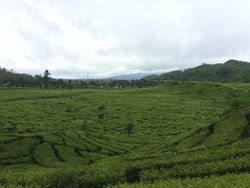 South: tea plantations. Ciwidey & Pangalengan are the main destination to the south mountains. Situ Patenggang lake in the middle of tea plantation in Ciwidey offers a relaxing time in a boat, fishing, camping or in a bungalow. 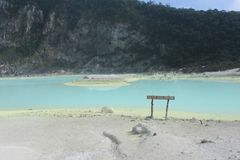 A few kilometers from the lake is Kawah Putih (white crater), made by sulfuric activity in the area with a camping park, called Ranca Upas. The area is frequently use as pre-wedding photography area. Entrance fee: Rp 150,000/car or Rp 5,000/motorcycle plus Rp 16,000 per person. Significant different entrance fee between car and motorcycle due to Forestry Administration discourage of using cars. West: chalk mountain range. There are not many nature destinations in the west, except Situ Ciburuy lake at the side of the main road hub to Cianjur and the Saguling dam. You might also want to taste peuyeum, a local food made from fermented cassava. If you are hungry, there are plenty of good Sundanese restaurants in the vicinity, because the road (non toll) to the west is the main hub between Bandung and Jakarta through Puncak. East: a link of Bandung to the eastern part of West Java and to neighbouring Central Java province. You can go to Sumedang, famous for their tahu sumedang fried tofu, on road to Cirebon (about 2-3 hr), a coastal city known for fishing and oil industries. To the southeast you can go to Garut (about 1-2 hour), a resort city in the valley of mountain, and visit 8th century Hindu temple Candi Cangkuang. The city also well known for its dodol snack. Further Southeast is the Pangandaran beach, facing Southern Java coast Indian Ocean. This page was last edited on 1 January 2019, at 15:35.